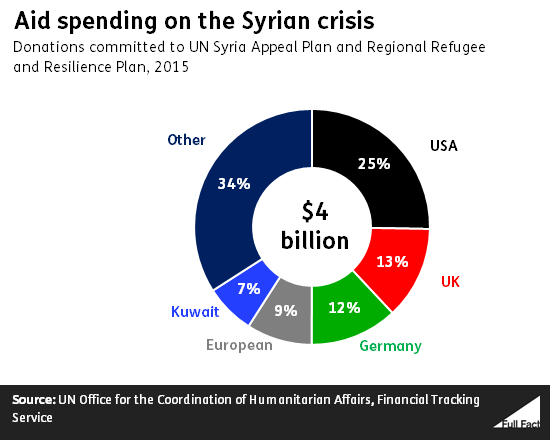 Only half the UN's appeal for Syrian aid was funded last year. That's about right—in 2015 the appeal received $4 billion (56%) out of the $7.2 billion it wanted. Nearly half of the aid sent to Syria came from the US and UK compared to 1% or less for other countries such as Saudi Arabia and Japan. That was correct of one of the UN's funds. Taking the two main funds together the UK and US made up 38% of funding, and Japan gave just under 3%. World leaders are meeting in London today to discuss financial aid for Syria. The aim is to agree “significant new funding” towards the $7.7 billion the UN says is needed in 2016 to deal with the crisis in the region. As the Minister says, about half of the $7.2 billion asked for last year was funded. That money is for two UN humanitarian aid plans—one for Syria, and another for neighbouring countries which are struggling with large numbers of Syrian refugees. Ms Husain’s figures are pretty much correct for the fund that sends money directly to Syria. Looking at funding for both the UN’s plans together the percentages are a bit different, with commitments from the USA and UK adding up to 38% of the total rather than just under half of it. This year it has asked for $3.18 billion to pay for its ‘Humanitarian Response Plan’, which aims to deliver humanitarian aid “to save lives, alleviate suffering and maintain and protect human dignity” in Syria. And it’s asked for another $4.55 billion for the ‘Regional Refugee and Resilience Plan’, which gives aid to Syrian refugees and other affected groups in neighbouring countries; Lebanon, Jordan, Iraq, Turkey, and Egypt. In 2015 governments, international organisations and private donors committed $4 billion of the $7.2 billion the UN asked for, or 56% of it. A quarter of that money came from the United States. The UK put in 12.8%, and Germany put in 12%. Japan contributed 2.9%, France 1.2%, Saudi Arabia 0.5%, and Russia 0.1%. Mishal Husain’s figures are broadly correct for the funding commitments to the Humanitarian Response Plan, rather than both plans together. Saudi Arabia committed around 1% of the money to that plan, Japan committed 2%, Russia 0.4% and France 0.1%.